The Party of No Brains and the Party of No Guts present to the world the The Benghazi attack and subsequent clown-show investigation – events that are products of willful ignorance, boundless stupidity, as well as a strategically narrow hard-on for knocking Iran off the chessboard at damn-near any cost. Thanks to these guys, this gift will not only keep giving, but the fallout can also deliver the next terrorist attack or major war to your mama’s doorstep. Now that I got a chance to vent, let’s talk about the Benghazi story the two major political parties aren’t talking about – yet. There’s a crazy amount of ground to cover today, so I’ll break this piece into two parts with today’s post establishing why the CIA more than likely had Benghazi on the radar for a long time, despite the newfound interest by Congress. Benghazi has been an attractive spot for terrorism and insurrection for YEARS. 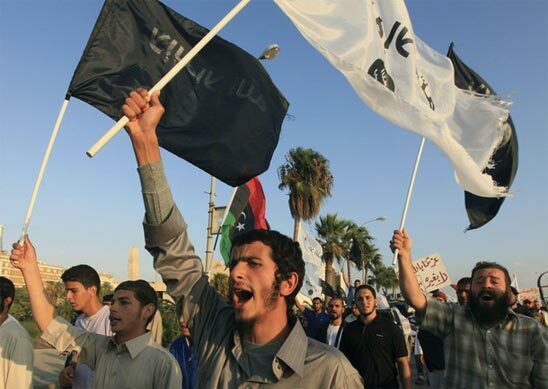 For instance, a 2007 study (PDF) by the Combating Terrorism Center at West Point identified Libya as the top country for recruiting Al-Qaeda fighters before and during the second Iraq War. The study also found that Benghazi is one of the top Libyan cities for supplying these fighters. Some of those aforementioned fighters are members of the Al-Qaeda-linked Libyan Islamic Fighting Group, a US State Department-recognized terrorist organization that’s not only responsible for killing Americans in the 1970s as well as more recently during Iraq War Part 2, but some members of the group are also prominent actors in the armed opposition group who fought against Muammar Ghaddafi in the 2011 Libyan Revolution. More generally, Libya has been a current source for providing fighters and weapons to topple President Assad’s regime in Syria, Thanks to the CIA and colleagues of slain US Ambassador to Libya, Chris Stevens. This shouldn’t be a surprise since the US has been a virtual sugar daddy to Syrian opposition groups for at least seven years. This is probably the right time to re-emphasize that some members of the Syrian opposition have Benghazi as well as Al-Qaeda links. While there’s enough evidence to say that Al-Qaeda has a voice in how Benghazi, if not all of Libya, will be run, you can make the argument that the jihadists are in full control of Libya. Let’s take a common sense break – with all this jihadist activity in and around Benghazi, do you seriously believe the CIA avoided being in that city? Hell, are you one of those people still in denial about the FBI having a hangout in Karachi? Of course the CIA’s been in Benghazi. The spy group even pretended to be US diplomats at the Benghazi US consulate. This entry was posted in Politics, Uncategorized, War and tagged Al Qaeda, Arab Spring, Bashar al-Assad, Benghazi, CIA, Jihad, Libya, Libyan Islamic Fighting Group, Syria, Terror, War. Bookmark the permalink.